Here is another of Peter's small C.E.O. assisted opening knives. 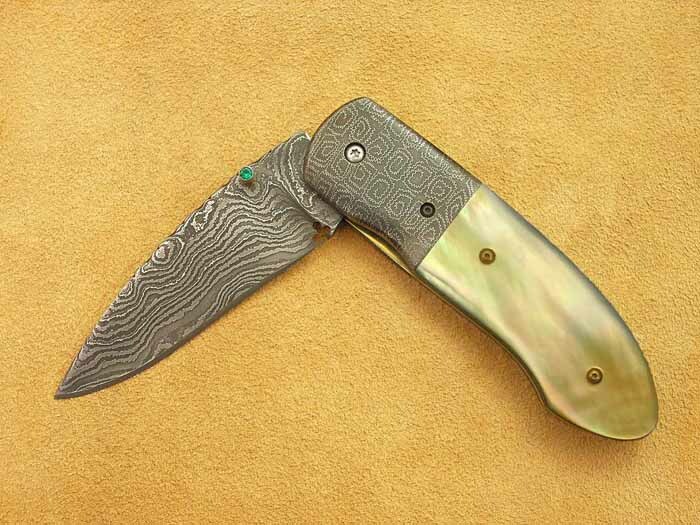 The Damascus blade is 1095 and L-6 blade and is 2 7/8" in length and the overall length is 6 1/16". The bolsters are Peter's Mosaic Damascus. The handle is Gold Lip Pearl. The thumb stud is 18 K Gold with a nice Emerald inset. The top of the blade and part of the spring is file worked.